The World eagerly waits for this day .Christmas is an annual commemoration of the birth of Jesus Christ, celebrated generally on December 25 as a religious and cultural holiday by billions of people around the world. A feast central to the Christian liturgical year, it closes the Advent season and initiates the twelve days of Christmastide. 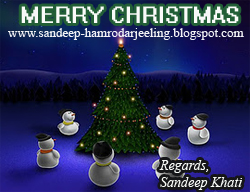 Christmas is a civil holiday in many of the world's nations, is celebrated by an increasing number of non-Christians and is an integral part of the Christmas and holiday season. The precise day of Jesus's birth, which historians place between 7 and 2 BC, is unknown. In the early-to-mid 4th century, the Western Christian Church first placed Christmas on December 25, a date later adopted also in the East.Theories advanced to explain that choice include that it falls exactly nine months after the Christian celebration of the conception of Jesus, or that it was selected to coincide with either the date of the Roman winter solstice or of some ancient pagan winter festival. The original date of the celebration in Eastern Christianity was January 6, in connection with Epiphany, and that is still the date of the celebration for the Armenian Apostolic Church and in Armenia, where it is a public holiday. As of 2011, there is a difference of 13 days between the modern Gregorian calendar and the older Julian calendar. Those who continue to use the Julian calendar or its equivalents thus celebrate December 25 and January 6 on what for the majority of the world is January 7 and January 19. For this reason, Ethiopia, Russia, Ukraine and Macedonia celebrate Christmas, both as a Christian feast and as a public holiday, on what in the Gregorian calendar is January 7. The popular celebratory customs associated in various countries with Christmas have a mix of pre-Christian, Christian and secular themes and origins.Popular modern customs of the holiday include gift giving, Christmas music and caroling, an exchange of Christmas cards, church celebrations, a special meal, and the display of various decorations, including Christmas trees, lights, nativity scenes, garlands, wreaths, mistletoe, and holly. In addition, several closely related and often interchangeable figures, known as Santa Claus, Father Christmas, Saint Nicholas and Kris Kringle among other names, are associated with bringing gifts to children during the Christmas season and have their own body of traditions and lore. Because gift-giving and many other aspects of the Christmas festival involve heightened economic activity among both Christians and non-Christians, the holiday has become a significant event and a key sales period for retailers and businesses. The economic impact of Christmas is a factor that has grown steadily over the past few centuries in many regions of the world.